Vilified in the West as the Japanese equivalent of Hitler, Hideki Tojo was cut from very different cloth. The definitive study of the equipment and organization of the Allies fighter units throughout the war, along with details and squadron markings. USA: Dr Robert H Goddard, the father of modern rocket propulsion, launches the first successful liquid-fueled rocket at Auburn, Massachusetts. Flying for only 2.5 seconds, it travels 184 feet at 60 mph. 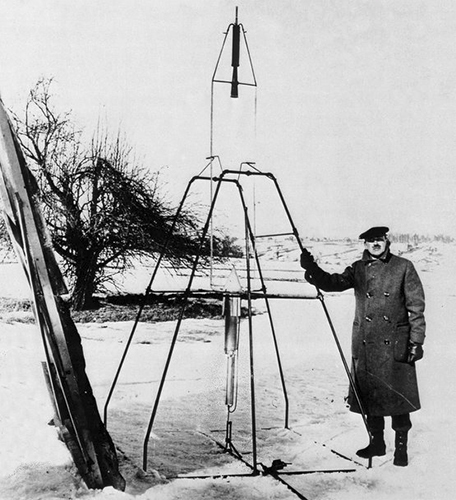 Robert Hutchings Goddard, American engineer, professor, physicist and inventor, is heralded as the father of modern rocketry; and for very good reason. His achievement of the world's first liquid-fuel rocket is considered as significant as the Wright Brothers' first flight. Over the course of his career, Goddard not only developed the theoretical calculations for rocket flight but also made practical advances in rocket design and construction. His initial study of rockets was undertaken at his own expense. He began by experimenting with gunpowder, and launched his first powder rocket in 1915. But powdered rockets were inefficient. Only 2 percent of the available energy was being converted into motion, which he eventually was able to increase to 63 percent. In 1919 Goddard discussed the possibility of escaping the Earth's gravity completely. According to his calculations, a rocket could one day travel to the moon and explode a load of flash powder to mark its arrival. The press immediately seized hold of the idea, but many people shot down the notion that a thrust was possible in the vacuum of space. Goddard found himself receiving a great deal of attention, much of it negative. The New York Times published an editorial scoffing at the idea. In 1969, after the launch of Apollo 11, the newspaper published a correction. Throughout his life, Goddard attempted to catch the interest of the military. For much of the time, they saw little practical application in using his ideas for warfare. After the United States entered World War I, he developed several military rockets, but none were implemented at the time. During World War II, an anti-tank weapon similar to ones Goddard had designed were utilized - the bazooka. During WWII, the Navy employed Goddard to build liquid-fueled rockets for jet-assisted aircraft takeoff. CBI - China: Day 75 of 142 of the 1st Battle of Hebei. Germany: Hitler announces conscription for compulsory military service, a new 36-division Wehrmacht (Army), and the existence of the Luftwaffe. All are in violation of the Versailles Treaty. Spain: Day 243 of 985 of the Spanish Civil War. Spain: Day 608 of 985 of the Spanish Civil War. Italian aircraft based in Majorca begin a three day around-the-clock bombing campaign on Barcelona. Meanwhile, Spanish Nationalists force the Republicans to retreat. CBI - China: Day 253 of 2,987 of the 2nd Sino-Japanese War. Day 38 of 124 of the Battle of Henan. The Japanese mount a full offensive on Tengxian. Late in the battle, the Japanese manage to take the east gate only to lose it again three hours later. Czechoslovakia: In western Czechoslovakia, the German Protector Konstantin von Neurath immediately begins enacting anti-Semitic laws. Spain: Day 973 of 985 of the Spanish Civil War. CBI - China: Day 618 of 2,987 of the 2nd Sino-Japanese War. Atlantic: Yugoslavian steamer SLAVA hits a mine laid by German sub U-29 and sinks in the Bristol Channel. ETO - UK: German JU-88s bomb the Royal Navy Home Fleet at Scapa Flow naval base near Scotland. This raid inflicts the first British civilian death of the war. MTO - Italy: Benito Mussolini holds peace talks with US envoy Sumner Welles in Rome. CBI - China: Day 984 of 2,987 of the 2nd Sino-Japanese War. Day 123 of 381 of the Battle of South Guangxi. Day 49 of 67 of the Battle of Wuyuan. Atlantic: German sub U-100 becomes the first submarine to be tracked by radar. It is sunk by HMS VANOC with depth charges. In the same action, U-99 is scuttled after being damaged by HMS WALKER. Atlantic: German bombers sink the British anti-submarine trawler HMT LADY LILIAN and damages HMT ANGLE 85 miles west of Ireland. Atlantic: German battlecruisers SCHARNHORST and GNEISENAU attack a convoy 950 miles east of Nova Scotia, sinking or capturing 10 ships. Atlantic: German sub U-106 sinks Dutch ship ALMKERK 220 miles off the coast of Gambia, British West Africa. With just two lifeboats, the entire crew of 66 survives. ETO - UK: Day 192 of 258 of the Blitz. The Germans bomb Bristol, targeting the docks at Avonmouth and the city's center. 257 people are killed and 391 more are wounded. Germany: Adolf Hitler predicts that the United Kingdom will fall by 1942. MTO - Greece: The Italian Primavera Offensive is called off after 8 days as the Italians have suffered 12,000 casualties. MTO: British submarine HMS PARTHEIAN damages Italian steamer GIOVANNI BOCCACCIO 50 miles east of Malta. East Africa: Day 280 of 537 of Italy's East African campaign in the lands south of Egypt. In British Somaliland, two Indian battalions make an amphibious landing at Berbera and take the port without any resistance from the 60 Italian troops stationed there. East Africa - Eritrea: Day 40 of 56 of the Battle of Keren. British and Indian troops capture Fort Dologorodoc. CBI - China: Day 1,349 of 2,987 of the 2nd Sino-Japanese War. Day 3 of 27 of the Battle of Shanggao. CBI - Thailand: Day 167 of 221 of the Franco-Thai War (Vichy France vs Thailand). USA: The HMS BEGONIA is loaned to the US Navy and renamed USS IMPULSE. Atlantic: Day 62 of 169 of Germany's Second "Happy Time," during which U-boats sink 609 Allied ships with little risk. U-332 sinks US tanker AUSTRALIA off the coast of North Carolina. U-404 sinks British tanker SAN DEMETRIO east of Hampton Roads, Virginia. ETO - UK: The Soviet ambassador in London expresses Stalin's wish for a second front in Europe. Germany: Belzec Concentration Camp is established for the purpose of holding and exterminating Jews from Lublin and Galicia. Russian Front - North: Day 190 of 872 of the Siege of Leningrad. Russian Front - North: Day 37 of 102 of the Battle of the Demyansk Pocket, another failed attempt to break the siege at Leningrad. Russian Front - North: Day 53 of 103 of the Battle of the Kholm Pocket. Another attempt to break the siege at Leningrad. Russian Front - Center: Day 68 of 103 of the Battle of Vyazma, Russia. Russian Front - Center: Day 68 of 103 of the Battle of Sychevsk, Russia. Russian Front - Center: Day 14 of 49 of the Battle of Rzhev, Russia, a diversion to pull more German troops away from Moscow. Russian Front - South: Day 138 of 248 of the Siege of Sevastopol, Crimean Peninsula. All German attacks against Sevastopol are shut down for the winter. CBI - Burma: Day 93 of 164 of Japan's Invasion of Burma. CBI - China: Day 1,714 of 2,987 of the 2nd Sino-Japanese War. Day 83 of 99 of the 3rd Battle of Changsha. PTO - Australia: Japanese warplanes bomb Darwin. PTO - Borneo: Day 91 of 107 of the Battle of Borneo. PTO - Malaya: Day 26 of 357 of the Battle of Timor Island. PTO - Philippines: Day 99 of 152 of the 1st Battle of the Philippines. 5th Air Force provides air support. US submarine USS PERMIT arrives at Corregidor to deliver ammunition and evacuate the codebreakers there. Atlantic: A German U-boat wolfpack begins a three-day attack on a convoy of 37 ships, sinking 12 of them. Another wolfpack attacks another convoy over a four-day period, sinking 11 ships. ETO: Joseph Stalin again demands that the western Allies open a second front in Europe. Russian Front: Germans begin using their new 37mm Flak gun mounted on JU-87Gs as an anti-tank weapon. Russian Front - North: Day 555 of 872 of the Siege of Leningrad. Russian Front - North: Day 35 of 51 of the USSR's Operation POLAR STAR, a failed offensive north of Leningrad, hoping to take the southern shore of Lake Ladoga, Russia. Russian Front - North: Day 316 of 658 of the Siege of the Kholm Pocket, USSR lays siege to the Kholm Pocket but the Germans hold out for a about a year and a half. Russian Front - Center: Day 15 of 30 of the 3rd Battle of Rzhev-Sychevka, Russia. MTO - Tunisia: Day 120 of 178 of the Battle of Tunisia. RAF and US Air Forces provide Allied air support. Day 1 of 12 of the UK's Operation PUGILIST in southern Tunisia. CBI - Burma: Day 86 of 104 of the 1st Battle of Arakan. US 10th Air Force provides air support. CBI - Burma: Day 37 of 79 of the Allied Operation LONGCLOTH. CBI - China: Day 2,079 of 2,987 of the 2nd Sino-Japanese War. CBI - Indochina: US 14th Air Force attack targets in French Indochina. PTO - Alaska: Day 283 of 435 of the Battle of Kiska, Aleutian Islands. US 11th Air Force B-25s, B-24s, P-40s and P-38s attack targets on Kiska Island and Adak Island. ETO - UK: Oswald Job, a British subject, is hanged at Pentonville Prison at Islington, Greater London, for spying. ETO - Germany: US 8th Air Force B-17s and B-24s bomb targets in Germany. Russian Front - North: Day 44 of 191 of the Battle of the Narva Isthmus, Estonia. Both German and Soviet troops in the Baltic region go on the defensive. Russian Front - South: Day 84 of 113 of the USSR's Dnieper-Carpathian Offensive in southwestern Ukraine. Russian Front - South: Day 13 of 45 of the Battle of Chernovtsy, Ukraine. Russian Front - South: Day 11 of 44 of the Battle of Snigirevka, Ukraine. MTO - Italy: Day 60 of 123 of the Battle of Monte Cassino. RAF and US Air Forces provides air support for the Allied ground troops. The Allies continue their push for Cassino, but make no real progress. MTO - Italy: Day 55 of 136 of the Battle of Anzio. RAF and US Air Forces provides air support for the Allied ground troops. CBI - Burma: Day 78 of 99 of the 2nd Battle of Arakan. CBI - Burma: Day 12 of 166 of the UK's Operation THURSDAY. Allied troops capture Mawlu which is a major rail link. Here the Chindits establish their WHITE CITY airbase and sever the Japanese communications in northern Burma. CBI - Burma: Day 7 of 147 of the Battle of Myitkyina. US 10th Air Force provides air support. CBI - China: Day 2,445 of 2,987 of the 2nd Sino-Japanese War. US 14th Air Force hits targets in China. CBI - India: Day 9 of 118 of the Battle of Imphal-Kohima. The Japanese continue pushing into India. PTO - Marshall Islands: US 7th Air Force attacks targets in the Marshalls. PTO - New Guinea: Day 17 of 80 of the Battle of the Admiralty Islands. 5th Air Force provides air support. PTO - New Guinea: Day 180 of 219 of the Battle of Shaggy Ridge. US 13th Air Force provides air support. PTO - New Guinea: Day 93 of 597 of the Battle of New Britain. 5th Air Force provides air support. PTO - Solomon Islands: Day 137 of 295 of the Battle of the Bougainville Islands. 5th Air Force provides air support. ETO - UK: In London, A German V-2 rocket hits at Albert Road in Leyton, killing 23 and seriously injuring 18. Another rocket hits Willesden near Hampstead, damaging 200 houses. ETO - France: Day 229 of 284 of the Battle of Brittany. ETO - France: Day 183 of 236 of the Siege of Dunkirk. ETO: Day 57 of 66 of the Battle to the Rhine. Day 11 of 20 of the Battle of Ramagen. US 9th Air Force provides air support. ETO - Germany: Day 10 of 46 of the Battle of the Ruhr Pocket. ETO - Germany: Day 25 of 36 consecutive RAF night raids on Berlin. RAF Lancaster and Halifax bombers conduct mine laying operations off Helgoland and Kattegat. Germany: Heinrich Himmler checks himself into a sanatorium at Hohenlychen so that doctors there could treat his "influenza." He sends a resignation letter to Hitler. Russian Front - Finland: Day 183 of 223 of the Lapland War. Finland and Russia have joined forces to kick the Germans out of Finland's most northern province. Russian Front - Center: Day 153 of 206 of the Battle of the Courland Pocket in Latvia. German cruisers SCHLESIEN and PRINZ EUGEN give fire support for their ground troops defending Courland. Russian Front - Center: Day 51 of 75 of the Battle of Königsberg, East Prussia (now Kaliningrad, Russia). Russian Front - Center: Day 4 of 10 of the Battle of Braunsberg, East Prussia. Russian Front - Center: Day 50 of 63 of the Battle of the Heiligenbeil Pocket in East Prussia. Russian Front - Center: Day 35 of 54 of the Battle of East Pomerania, Germany. Russian Front - Center: Day 32 of 83 of the German Siege of Breslau (today Wroclaw, Poland). Russian Front - Center: Day 13 of 15 of the Battle of Kolberg, Germany (today Kolobrzeg, Poland). Russian Front - Center: Day 2 of 17 of the USSR's Upper Silesian Offensive in Germany (today Poland). Russian Front - South: Day 11 of 11 of the failed German Operation FRÜHLINGSERWACHEN (Spring Awakening) at Lake Balaton, Hungary. Two more Soviet Armies arrive, so the Germans quit their offensive and leave. Russian Front - South: Day 11 of 16 of the Battle of Drava (a river in Bulgaria). Germans attack the Bulgarians, hoping to distract the Soviet advance on Berlin. Russian Front - South: Day 4 of 34 of the Battle of Vienna, Austria. MTO: US 15th Air Force bombs targets in Austria, Yugoslavia and Germany. Some of the bombs dropped at Vienna land in the world's oldest zoo, killing 2,000 animals. CBI: US 14th Air Force attacks targets in China. CBI - Burma: Day 57 of 61 of the Battles of Meiktila and Mandalay. The US 10th Air Force provides air support. CBI - Burma: Day 41 of 99 of the Battle of Pakokku and Irrawaddy River operations in central Burma. The US 10th Air Force provides air support. CBI - China: Day 2,810 of 2,987 of the 2nd Sino-Japanese War. PTO - Alaska: US 11th Air Force B-24s fly to Matsuwa Island, marking their deepest penetration of the Japanese Home Islands to date. On the return they bomb Shimushiru Island. PTO - Japan: US 20th Air Force B-29s fire bomb Kobe, destroying over 3 square miles and causing 15,000 casualties, leaving a quarter million homeless. PTO - Japan: US 7th Air Force attacks targets on Chichi Jima Island. PTO - Japan: Day 26 of 36 of the Battle of Iwo Jima. US 7th Air Force provides air support. PTO - New Guinea: Day 445 of 597 of the Battle of New Britain. US 10th Air Force provides air support. PTO - New Guinea: Day 329 of 481 of the Battle of Western New Guinea. US 10th Air Force provides air support. PTO - Philippines: Day 148 of 299 of the 2nd Battle of the Philippines, aka the Liberation of the Philippines or the Philippines Campaign. PTO - Philippines: Day 92 of 244 of the Battle of Luzon. 5th Air Force provides air support. PTO - Philippines: Day 7 of 159 of the Battle of Mindanao Island. 5th Air Force provides air support. No rocket or jet plane could have flown without the genius of Robert H Goddard, the American father of rocketry and space flight. The turbulent history of the Luftwaffe from its earliest days as the world's most advanced air force to its ultimate downfall. During a routine search mission over the Pacific, Louis Zamperini's plane crashed into the ocean, and what happened to him over the next three years of his life is a story that will keep you glued to the pages, eagerly awaiting the next turn in the story and fearing it at the same time.